In 1962 the Ursuline Sisters from Waterford first came to Cabinteely at the request of the then Archbishop of Dublin, Most Reverend Dr. McQuaid. They bought Kilbogget House and the lands associated with it from the Broderick family. Kilbogget House is now the centrepiece of Shrewsbury Wood, a housing estate situated beside the school. The Ursuline Convent is located in this estate. The school began for the first time on the 4th September 1963 under the title of "Our Lady of the Angels". It was a Secondary Day School and a private Primary School for girls. In the following years the school developed in the Convent buildings and in prefab classrooms until the new Secondary School building was opened in 1970. This two storey building is now occupied by the Community School. In the years 1970-1975 it became clear that major expansion would be required. Plans were made to allow the school to become a Community School. On the 1st August 1975 a Board of Management formally took over the management of the school and it became Cabinteely Community School. Work on the main school building commenced in March 1977 and it was ready for use in the school year 1978-79. The school Sports Hall became available in September 1982. The Ursuline Junior School closed in June 1984. Its buildings, including St. Angela's Hall, were purchased, on behalf of the community School, by the Department of Education & Skills. 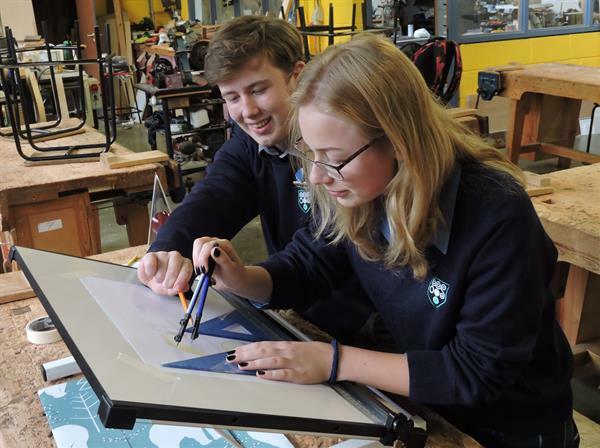 Over the past 43 years the school has continued to meet the aspirations of its founders by providing a modern, excellent educational experience - not just academic but vocational, moral, spiritual, social, physical and personal - in an atmosphere of respect, where each person could aim to be 'the best that they can be'. That is the school motto and the school endeavours to provide just that - the opportunity for each individual to reach their potential in a supported and respectful environment. We continue to place the child at the centre of all we do, never losing sight of the fact that we are dealing with individuals and their unique personalities, varying experiences and many differing needs. We have, over the years, built on and sustained the school as a learning community by embedding in our students a strong sense of social responsibility along with relevant transferable skills which will serve them well in the real world setting and help them grow into mature, free individuals. As part of our 40th celebrations a school flag was collaboratively designed by the staff, students and parents. A huge amount of thought went into the projects and the final result (depicted below) is very symbolic. The past is represented by the blue of our founding Ursuline Sisters, they who founded their school on this site in 1962 and without their vision, aspiration and courage, the present school would never have come to be. The distinctive jade green symbolises the present - it is very evident on the school jumpers of our junior students and on our crest. The white represents the future as yet unwritten - to be decided, shaped and crafted by the experiences of the many who have and will pass through the doors of this fine school in the years ahead. The central crest unites all these aspects.